The Drager Flame 1300 is an IR flame detector, designed for the detection of organic based fires such as hydrocarbon fuels and vapours. The detector provides flexibility with its numerous output modes, and advanced design features ensure reliability in the detection of fires whilst at the same time providing excellent immunity to potential false alarm sources. Installation is simple! The detector is easily installed with a stainless steel mounting bracket; which can be rotated to ensure optimum positioning of the detector in relation to the potential fire source. Angular markings allow the positioning angles of the detector to be recorded for future reference. As well as a 4 to 20 mA output and 3 relays, an optional RS 485 output is also available, which can be multi-dropped to a central location. This provides a number of options for detector monitoring and the triggering of the necessary control action upon the detection of a fire. Automatic and manual optics checks Automatic checks of the detector elec tronics and optics ensure no fault goes undetected. Additionally the test can be triggered manually at anytime. Complete flexibility enables the detector to be operated from a separate power supply (as a 4 wire device) or as a 3 wire device where there is no requirement for an isolated output. A tri-coloured LED which is visible at the front of the detector provides a simple status indication to personnel in close proximity to the detector. Green indicates normal operation; yellow indicates a fault and red indicates the presence of radiation. 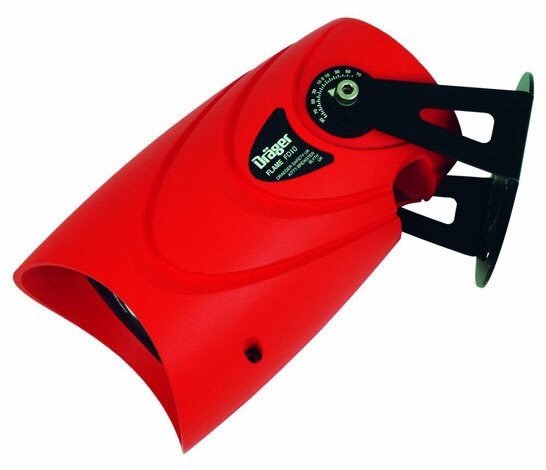 The Drager Flame 1300 can be used worldwide with the following approvals: ATEX, IECEx, FM and CSA.